His words brought comfort but it was challenging piecing syllables together with clarity. Comprehension caused enough distraction to transfer my focus to the simple act of walking. Two little words: altitude sickness. Dark clouds hovered in the distance in unknown direction, the day crept later. Step by step I told myself I could do it, to go big or go home, as if filmed for an inspirational video. Inner dialogue a product of survivalism being the youngest of four. Hazy consciousness imagined myself anywhere in the world, hydrated, splashing toes poolside sipping frozen fruity fun. I felt drunk without cause, or known way to improve symptoms. Four days prior I swam in the Gulf, sea level. 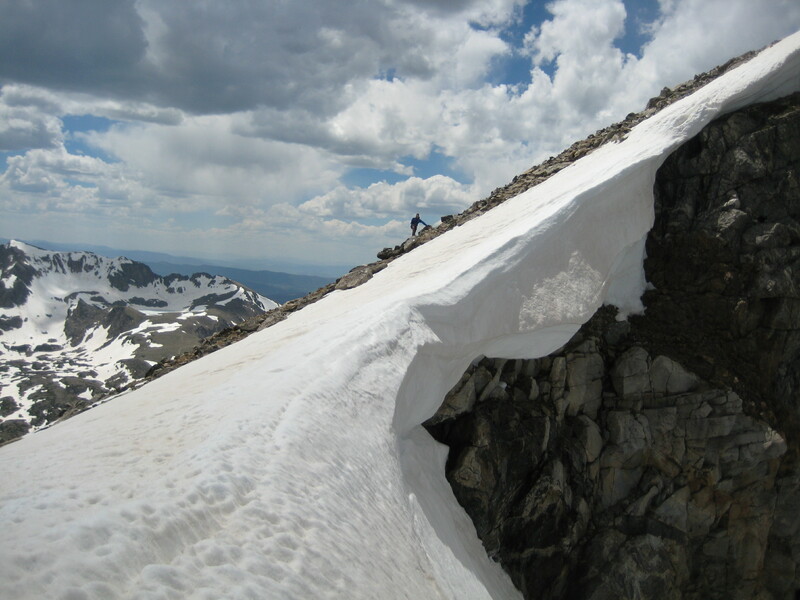 Today, I summited South Arapahoe, Colorado. Her peak beautifully severed the sky at 13,343′. The hike up was magical. My friends gave options to turn back, but the view had me wanting more. I felt good for a flatlander in the Rockies, despite the occasional cartoon heart leaping from my chest. Trails in the horizon could be seen cut into the hillside at Winter Park. Snow capped peaks appeared brilliantly, layer behind layer as we gained elevation. Nature displayed her beautiful tapestry, seen only by hikers, birds or aircrafts. Turquoise glacier water and June snow captured my gaze, as if a calendar photograph came to life. Backcountry skiers left me in awe enduring such a trek carrying gear for a sliver of vertical. At least one full hour we hiked straight uphill, no slalom, no switchback, no traverse. I don’t love hiking, but few of my most physical feats in life have been climbing peaks and treasured memories with those who have trekked beside me. Sunlight perceived brighter than normal, the alpine glow pierced my cranium which already felt snug between vice grips. Colorado wildflowers displayed their preciousness. I was surrounded by such good energy with these friends as if minutes, not 14 years had passed since seeing them. Upon the descent we reached a snowy area, siphoning energy pulling whichever foot sunk inches deep. Body parts stopped working cohesively, similar to a rusty bike chain. I felt like an orangutan, swinging arms in delirium. Motor functions began to deteriorate. For all I knew, I was replica of a thoroughbred in a Muybridge slow motion film. Perhaps galloping across a prairie racing cowboys on a ranch would be my next adventure…It was going to be a long descent in my dreamy pace. My friends were so patient, so kind. With the ill display I was about to share, anyone in their right mind should have abandoned me with the marmots. I understood the concept move to improve by continuing downhill, yet each cell in my body yearned to collapse upon the earth alongside a flower or moss covered boulder to wait out my nauseousness. I wanted to get sick to feel better, but only hiccups and dizziness sustained. I could have been at an all inclusive swim up bar listening to Buffet play over a Bose PA. I wanted to research the science behind what my body was enduring. Symptoms started with a headache, transferring to challenged motor skills. The simple act of speaking or sipping water caused nauseousness. I was informed little grows at the summit, making me grateful for pressurized cabins in flight. Discomfort made me feel vulnerable, aware of each decision, shifting attention inwardly to take care of myself. Yet another reminder lately to secure my own oxygen mask prior to assisting others. Tree roots exposed themselves displaying a beautiful gray hue. Time felt stagnant but nature seemed to come alive, as if placed in a scene from Alice in Wonderland requesting my awareness. A cute marmot peered at us inquisitively, another sat upon a rock chirping. The terrain was rugged, alternating between waterfalls, mud, grass, boulders and snow, each requiring concentration. My travel sneaks didn’t have appropriate treads or waterproofing for such terrain, I hiked in wet socks for hours. We meandered through low brush and prickly trees that cut my ankles. All was a hikers high until we did some foot skiing which shifted things. My front roll and bum slide tumble downhill were worth the gained footage and belly laughs. I felt completely alive and present. No humans other than the three of us in close proximity for hours. Completely immersed in natures beauty, then it hit me…I got sick, and I got sick, again. Carrots came forth leaving my insides raw. Eyes became puffy, hands sore upon whichever surface I fell on to with little warning, in a not so classy downward facing dog. Hours later we arrived at the truck, slid into flops and dangled legs off the tailgate gazing at our accomplishment. We boosted ourselves stiffly into the vehicle and headed down the windy dirt road. Oh my goodness, I was hesitant to inform them of my other dear friend; car sickness. It crept upon my current layer of discomfort. I asked my friend to pull over if I raised my hand. Hand shot upward, unfortunately having to dodge a vehicle cost me seconds, and my friend a clean exterior. Head lurched out the passenger side window, too sick to feel embarrassed, then exiting his ride I watered the dry soil. A bus drove past on this rural road, leaving them with a tourist visual on altitude sickness. I was flooded with dry erupting pain. I was a volcano lacking lava. Ooh, reminds me of a Buffet song…Hands swollen like water balloons, bloated, stiffening, what was happening in my body, or better question, what wasn’t?! Each bend along that dirt road my friend drove so patiently and courteously. Dinner plans were canceled, instead returning to his home where decisions were made to take care of my immediate needs of a shower and rest. His wife welcomed me with open arms in my state of delirium. My body had an alternate agenda over my intended red eye. Appreciated shower water trickled over fresh ankle cuts, water pinned to hot.